Gulzira Auelhan, an ethnic Kazakh woman born in China, spent time in four different indoctrination centres in Xinjiang before working in a factory. Before she was shocked with a stun gun to the head for spending more than the allotted two minutes in the toilet, and before she was handcuffed for 24 hours because guards accused her of letting another woman participate in religious washing, and before she was forced to make winter gloves for two pennies a piece − before all of that, Gulzira Auelhan remembers a Chinese police officer telling her she needed to be educated. The classes would only last 15 days, the officer told her in mid-October, 2017. “You will be released very soon,” Ms. Auelhan, 38, remembers hearing. An ethnic Kazakh who was born in China but had been living in Kazakhstan, she had returned to China’s far western Xinjiang region to visit her father, who was ill. Instead, over the course of 437 days, she was detained in five different facilities, including a factory and a middle school converted into a centre for political indoctrination and technical instruction, with several interludes of a form of house arrest with relatives. The Chinese government has said it offers free vocational education and skills training to people such as Ms. Auelhan. But over more than 14 months, “that training lasted one week,” she said, not including the time she spent forced to work in a factory. 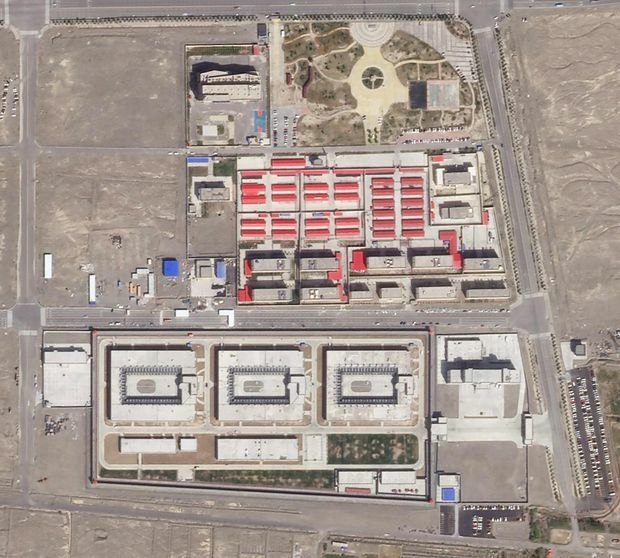 Sept. 17, 2018: A satellite image released by Planet Labs shows buildings around the Kunshan Industrial Park in Artux, Xinjiang, reputed to be one of the internment camps where Muslims are detained. Chinese authorities have kept Xinjiang’s detention centres shrouded in secrecy, refusing to provide statistics on the number of people they contain or to open them to visitors, save on choreographed official tours (on one earlier this year, detainees sang If You’re Happy and You Know It, in English.) Last year, police threatened a Globe reporter with arrest for approaching one such facility, and forcibly deleted photographs of its exterior. Yet through satellite imagery, government procurement documents, accounts from previous detainees and testimony from overseas relatives of people living in Xinjiang, the international community has gained an increasingly comprehensive understanding of what is taking place in Xinjiang. Western governments have been more critical, but activists are demanding stronger action, including from Canada. Human-rights groups and representatives of the World Uyghur Congress will arrive in Ottawa this week for meetings with parliamentarians and government officials. They want the Trudeau administration to impose human-rights sanctions on Xinjiang leadership, expedite asylum cases from the region and publicly pledge not to send Muslims from Xinjiang back to China where, former detainees said, the mass incarceration of minority groups − including Uyghurs, Kazakhs and others − continues unabated. In the Kazakhstan city of Almaty, The Globe spoke with seven people, including Ms. Auelhan, who have spent time in indoctrination and detention centres in Xinjiang. Each account differs, in the locations where detainees were held, in the length of their detention and in the treatment they sustained. In aggregate, though, they help to trace the outlines of an extensive system that has taken shape in Xinjiang, one that employs a wide range of restrictions on personal freedoms and a complicated array of different types of facilities. But the networks of confinement and indoctrination in the region, built under an extensive system of computer vision-equipped surveillance, comprise an effort to exert “ultimate ideological, and to some extent also ethnic and racial, control,” said Adrian Zenz, a scholar at the European School of Culture and Theology. Add in all the other forms of detention outside formal prisons, however, and a better estimate is 1.5 million, Mr. Zenz said, a tally that does not include house arrest. And the reach of the system extends beyond Xinjiang borders and into neighbouring countries such as Kazakhstan, where some say evidence of surveillance has left them panic-stricken even months after leaving China. Others say they remain bound by a guarantor system that holds relatives still in China responsible for the conduct of those who have exited the country. Ms. Auelhan, like most of the people interviewed for this article, is a Chinese-born ethnic Kazakh, a mother of three who says her main ambition in life has been to raise her children well. She moved to Kazakhstan in 2014, but returned to China for a visit on Oct. 16, 2017. Chinese border officials seized her passport and ordered her to wait until the arrival of police, who escorted her to her hometown in Duolang Village. They told Ms. Auelhan she could not go to see her father. Rahima Senbai spent 70 days in a detention centre, where the cell was equipped with a television that played political programming. On the same day in October, 2017, that Ms. Auelhan entered China, police in Xinjiang’s Tekes County asked Rahima Senbai to come to their office. “It won’t take much time,” they said. When she arrived, they took her directly to a detention centre, where she was placed in a cell with 24 women. At one point, she and the others were handcuffed and shackled for a full week. She stayed for 70 days before being sent to a place called a ”recruitment centre,” where people in masked biohazard suits delivered injections of what they said were anti-flu medication. Guards there once shocked her with a stun gun to the shoulder when she was too weak to walk quickly. “I felt like a slave,” Ms. Senbai said. Others described dramatically different experiences, in a region where detention has taken many forms − many of them rapidly expanding. Xinjiang spending on construction of security-related facilities more than doubled between 2016 and 2017, an increase of nearly $4-billion in a single year, Mr. Zenz wrote in a report for the U.S.-based Jamestown Foundation. According to his analysis, per capita spending on domestic security in Xinjiang in 2017 was more than triple the national average. Some of that security apparatus, former detainees said, fosters dehumanizing conditions. On Sept. 28, 2017, Chinese state security took Tursynbek Qabi, 45, to the basement of a prison facility and locked him in a cage that was too small for him to lie down. Accused of taking family members to Kazakhstan, he was kept there for six days, sleeping slumped against the bars on the side of the cell. “It was like an animal cage,” he said. Mr. Qabi was then released to a kind of town arrest − allowed to go home, but not allowed to travel elsewhere without permission. Local officials ordered everyone under the age of 50 to attend nightly Chinese language classes from 6 to 8 p.m., he said. 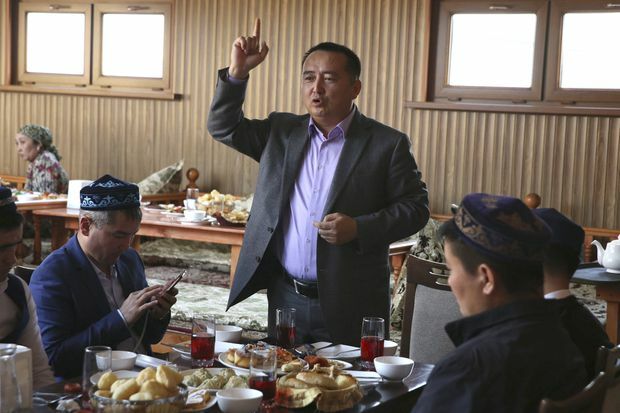 Tursynbek Qabi is now in Kazakhstan with his wife, Oralhan Aben, after Mr. Qabi spent six days in the basement of a prison facility in Xinjiang, locked inside a cage that was too small for him to lie down inside. Elsewhere, formal incarceration is followed by less restrictive confinement. Razila Nural, 25, spent a year in an indoctrination centre before being transferred next door to a factory sewing prisoner uniforms for nearly four months. But when Ms. Nural was released, she was not allowed to return to her big-city advertising job, said her mother, Nurbaqyt Qaliasqar. The last time they spoke by telephone, Ms. Nural was under a kind of municipal detention, and “can’t go to another city for work,” Ms. Qaliasqar said. Her daughter has instead been assigned a job at a village administration office. Others were placed in very different facilities. Tursynmuhamet Duisenbai, 42, was detained from December, 2017, to September, 2018. But he spent most of that time incarcerated in a Communist Party school, another form of indoctrination centre, with a more relaxed atmosphere. Dinners included a piece of meat and detainees were free to eat until they were full. Dakei Zhunishan, 43, also spent six months in a Party school, a place he described as “almost free.” Rooms were equipped with televisions, guards did not require permission to use the toilet and “relatives could come to visit whenever they wanted,” Mr. Zhunishan said. Detainees could not, however, exit the compound without authorization. But if the use of Party schools, detention centres and house arrest underscores the diversity of tools employed to confine people in Xinjiang, what many shared was a commitment to providing detainees a form of education that often included advocating secular thinking. The detention-centre cell where Ms. Senbai stayed was equipped with cameras, a loudspeaker and a television set that displayed programming “about Chinese policies and Xi Jinping. We had to watch it,” Ms. Senbai said. Later, at the indoctrination centre, instructors asked us, ’Why do you believe in God? Do you think that if you need money and you pray, that God will give you money? You should think logically,’ ” Ms. Senbai recalled. Religious practice is prohibited inside indoctrination centres, China’s State Council Information Office recently acknowledged, citing laws banning religion from educational facilities. The Chinese government has stressed that detainees also receive valuable employment training, in centres that “regard learning vocational skills as an important way to enhance trainees’ ability to find work,” the recent Xinjiang white paper said. Yet former detainees interviewed by The Globe said such training was scant, at best. In nearly a year of detention, Ms. Senbai spent 45 days studying hairdressing. “But in fact we didn’t learn anything,” she said. “For example, I didn’t learn how to cut hair.” Daily lessons consisted of two hours of theoretical instruction. Students were then given books to study. In a month and a half, she completed a single haircut, on another detainee who she persuaded to volunteer so she could make an attempt. Others, such as Mr. Duisenbai and Mr. Otan, received no training at all. “I would have been happy if there was such a thing,” said Mr. Otan, who spent seven months in an indoctrination centre in 2017. Chinese officials stress that detainees get valuable employee training. But Zharqynbek Otan, 31, says he got no training at all at the indoctrination centre he was sent to before being released into a strict form of house arrest. 'I would have been happy if there was such a thing,' says Mr. Otan, shown with his wife, Shynar Kylysheva, and son Aqzhol Zharqynbek in Almaty. Soon after arriving at the first centre, Ms. Auelhan began to learn the rules of her new life. Each night, she and the others took two-hour shifts to watch each other. “Even if you wanted to kill yourself, there was no possibility, because you are being monitored everywhere,” she said. Trips to the toilet had to be done in pairs, so one woman could keep an eye on the other, in part to prevent forbidden religious expression, including ablution. Once, Ms. Auelhan accompanied to the toilet an older lady who accidentally splashed urine on her own feet. When guards noticed that the woman had rinsed herself clean, they saw it as ritual washing, and punished Ms. Auelhan by handcuffing her hands behind her back for 24 hours. In April, 2018, she said, prison staff brought out buckets of prayer mats and ordered the detainees to set them on fire. China’s Ministry of Foreign Affairs did not respond to detailed questions sent about her account. But for Ms. Auelhan, who calls herself Muslim but does not pray, one of the chief hardships was use of the toilet, because women were restricted to two minutes each time. Detainees frequently experienced constipation − she’s not certain whether it was the infrequency of bathroom access or the daily diet of steamed buns, rice, potatoes and maize. But if they spent more than 120 seconds on the toilet, “you can expect you will be electric shocked,” she said. Stun guns would typically be applied to the head. “They explained that if they did it on the body, it might leave a mark,” Ms. Auelhan said. Guards told detainees that they were “under military discipline,” with cameras constantly watching − including in bathrooms and during weekly showers. Even so, monthly conjugal visits were allowed, she said, for a fee of $4; another detainee confirmed the existence of such visits. Ms. Auelhan found herself experiencing flashes of agreement, reflecting as she wrote on the happiness she had felt growing up in Xinjiang. But the feeling did not last, because “everything else they did to us was a complete lie,” she said. That extended to appearance: When her hair began to go grey, she was given dye to make it black when dignitaries visited, and told to smile. But Ms. Auelhan could not stop thinking about the gap between what she was being told and what she saw unfolding around her. “They say all of the ethnic groups in China are together in peace and love,” she said. Why, then, she wondered, were Muslims virtually the only ones in detention? In nearly a year spent in various indoctrination centres, she received a single week of instruction on a sewing machine, before being released Oct. 7, 2018. But she was not yet free. Instead, after a week spent with family, the next chapter of her detention was about to begin, in a factory. The indoctrination wasn’t over, either. In late November of 2018, the village secretary in Ms. Auelhan’s hometown arrived with a document. It said she needed to report for work to a glove-making factory. “You need money,” the official told her. At the factory, her superiors told her the gloves, whose brands she could not recall, would be sold abroad, “so we needed to try our best,” she said. She was taken to work at the Yining County Home Textile and Clothing Industrial Park where, according to a government website, the Yili Zhuowan Clothing Manufacturing Co. produces US$15-million a year in gloves for export to the United States, Russia, the European Union and Japan. A person who answered a phone at the company said he knew nothing about its hiring practices. Ms. Auelhan was promised pay of $119 a month, in a region where the local minimum wage is $290, until the factory’s owners, citing the cost of feeding her and ferrying her home for weekly Sunday family visits, switched to a piecemeal system, paying two cents a completed pair. On her best day, she completed 11 pairs. While at the factory, Ms. Auelhan lived in a dormitory roughly three kilometres away, where she could leave her room but not the compound. Here, too, education continued. Workers received readings in the factory before work and, at day’s end, 45-minute Chinese lessons in the dormitory, where they were watched at night by an official. Then, on Dec. 29, police took her for interrogation and held her overnight in a dark room. The next day, officials bought her a lunch of besbarmak, a Kazakh dish with horse meat and noodles. “They told me, ‘You must miss meat,’” she said. After lunch, they released her to her father’s house. She was paid $45.50 for her factory labours. On Jan. 5, officials escorted her to the Kazakhstan border. “Remember that you are not allowed to say anything about the camps or what you have been through while you were in China,” she recalled them saying. Kazakhstan represented an exit from the formal strictures of incarceration in Xinjiang. But she would also find it difficult to leave behind pressure from China. In that, she was not alone. Sayragul Sauytbay was an instructor in an indoctrination centre before fleeing to Kazakhstan – but the fears of Chinese retribution have continued to haunt her. The day Sayragul Sauytbay slipped across the border into Kazakhstan was the day she thought she had left behind her days as an instructor in an indoctrination centre in the Xinjiang mountains of Zhaosu County − and the fears that she herself was soon to become a detainee. Yet escaping those fears has proved to be more difficult than she could have imagined. In Kazakhstan, she was put on trial for illegally crossing into the country. On Aug. 1, 2018, a court gave her a six-month suspended sentence, a lenient judgment that allowed her to avoid deportation and prompted courtroom cheering. “I have my people, my nation, my homeland that can stand for me,” a jubilant Ms. Sauytbay said then. A teacher who ran a kindergarten before she was told to teach indoctrination-centre detainees, Ms. Sauytbay spent the six months of her suspended sentence milking a cow and selling bags of coal from her home in Esik, a 65-kilometre drive northeast of Almaty. Each day, the cow provides five litres of milk, enough for $2.80 in profit, while each bag of coal fetches a 35-cent margin. Authorities in Kazakhstan have twice denied her application for refugee status, leaving her anxious that she could be returned to China, or worse. She is now attempting to take legal action against the country’s refugee commission. Serikzhan Bilash, an activist against Chinese internment camps, speaks to a crowd of Kazakhs at an Almaty restaurant in March, 2018. Fears that Kazakhstan is no longer a safe haven grew more intense after the March 6 detention of Serikzhan Bilash, a Chinese-born Kazakh businessman who has posted thousands of videos to YouTube with testimony from and about Kazakhs in Xinjiang. Mr. Bilash has been accused of fomenting ethnic hatred. For others who have left China for Kazakhstan, concern remains for family members still in Xinjiang − some of whom have made themselves personally liable for those no longer in China. “My relatives signed documents as guarantors, saying when I am in Kazakhstan, I won’t say anything bad about China,” Mr. Qabi said. Others worry about the stain left on their own lives. Ms. Auelhan’s family has also struggled. She has a daughter still in Xinjiang, while in Kazakhstan, her husband struggles to believe that she vanished into detention centres for so long. He “is very good to me,” she said.